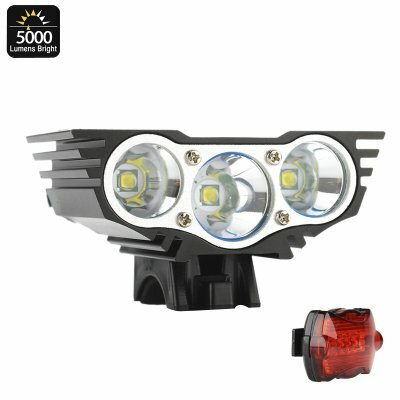 Successfully Added CREE XM-L U2 Bike Light Kit "RoadRunner II" - 5000 Lumen Front Light, Rear Light, Rechargeable Battery Pack, Quick Fitting to your Shopping Cart. The "RoadRunner II" LED bike light set includes both front and rear bike lights so your clearly visible on the road. with the front bike lamp containing 3 XM-L U2 LEDs that when combined pump out up to 5000 lumens of light you will have a clear view of the path ahead while guaranteeing that all those around you are aware of your presence. With an aircraft grade aluminum body that's coated by a military type III hard anodized coating this durable bike light it highly weather proof and suitable for those rainy days out. Powered by a 4800mAh rechargeable battery pack the "Roadrunner II" LED bike light brings around 3 hours of illumination. there are 4 light settings that can be cycled through at the push of a button letting you choose between loe, medium, high or strobing light so you can select the one that's right for you and the conditions. The rear light is powered by two AAA batteries and with its quick release clip and bracket is easy to mount on your bike or clothing. The "RoadRunner II" LED bicyclical light kit come with 12 months warranty, brought to you by the leader in electronic devices as well as LED lights and gadgets..